As you are preparing to apply to a health profession program, be sure to meet with an HPA advisor for advice on how to be th e best applicant you can be. HPA is here to help you through each step of the application process, from your primary application to your secondaries. Also check out our AppPrep Series for our application preparation workshops. 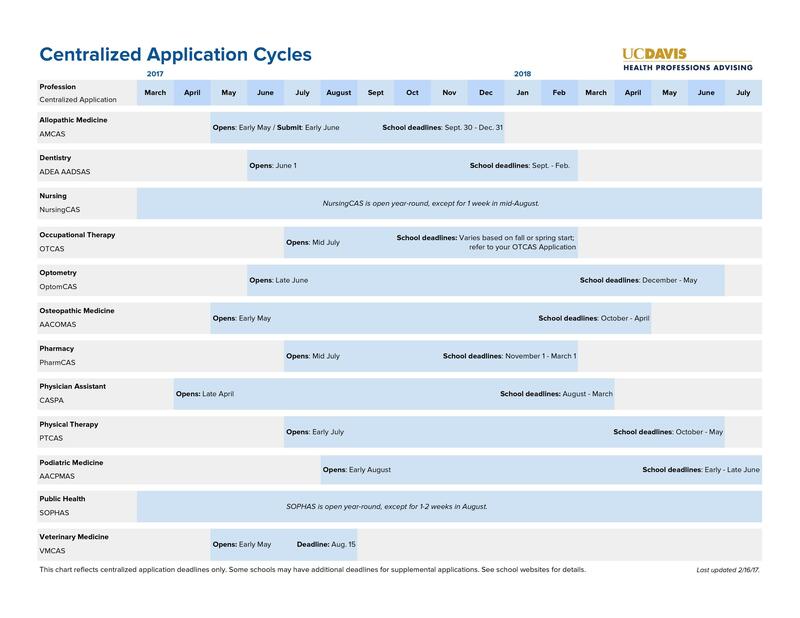 Check out the chart below for a general overview of the centralized application cycle dates for your health profession. Note: Some health professions and programs may not have a centralized application service. For those professions and programs, you will need to go to the specific school/program for their application. If the school or program you are applying to accepts applicants on a rolling basis, we recommend applying early. Note: You must obtain an official transcript from every institution you have attended; this includes community colleges. Please be aware that not all schools use digital PDF’s and that community college transcripts take three to four weeks to process and verify, so order transcripts early. You will be taken to UC Davis Transcript Order Services. Enter any information not already there. Select “Send Now” if your most recent grades are already posted. 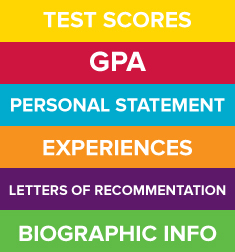 If your grades or degree are not already posted, you can choose to hold your transcripts until they are posted. Find your application service in the drop-down menu. For more official transcript request information, click here. Supplemental applications (or secondaries), if applicable for your health profession, are sent after the primary application has been submitted and include school-specific questions. (Note: Some programs and health professions will include their supplemental questions with the primary application.) Generally schools that use a centralized application system tend to use supplemental applications to collect specific information that they desire. Some programs will send a supplemental to every applicant, while others will pre-screen the applicant pool, sending supplementals to those who are most qualified. Tailor each essay to the program. "Speak" to the school by highlighting how you would be a good fit based on how your attributes and experiences align with their mission and philosophy. Know the schools to which you apply so that you can tailor your application to them. Do not copy and paste the same essay into multiple schools' secondary applications. Edit your secondaries carefully. Be sure not to include the wrong school name because you are in a rush and forget to edit. Never send first draft writing. Don't leave questions blank. If they ask an optional question, answer it if you can. Some programs offer fee assistance to applicants that will waive the supplemental application fees. To see if the program you are pursuing offers fee assistance, click here.